I thoroughly enjoyed and recommend this book. Any one who commutes by train will recognise some if not all of the situations written about and will definitely find this book entertaining. Well done!!! 5.0 out of 5 starsYour will never look at a train journey in the same way again!! I recommend this book as it's very entertaining and written in a way that compels the reader to finish the book in one sitting (or standing if your're on a train!!). The stories are gathered from the author's commute on two different trains over a twelve month period. My favourite story, one of three in Chapter 12 (Angels appear in December), is "The Amazing 'Miss Angelique' ", which deals with a pregnant Indian lady, Anna, who refused the offer of a seat on the train, gave her scarf to a child, and a £10 note to a beggar on the train. Quite possibly, this lady was an angel. A must read for those who travel on the train - your journeys in future will never be the same! It was 4:40am and we were waiting for the Airport shuttle to take us to the Cologne Bonn airport, so we could board our flight back to England. I detest early morning flights. 😡 Whose brilliant idea was it to have flights at such ungodly hours, l wondered? So annoying! There l stood with my daughter and best friend, waiting for the bus. It was so cold this morning. Germany was definitely colder than the UK. It was a 30 minutes journey to the airport and all l could think of was getting onto the bus and out of the cold. Therefore, the bus couldn’t come quickly enough for me. We shall miss my dear friend and her kids though. We had a great time at her home. These thoughts were going through my mind when l overheard a conversation between two American women standing nearby. One was telling her friend that since they do not check tickets, she won’t pay for the bus ride to the airport. Her friend encouraged her, telling her that as long as she goes in through the back door of the bus, it should be OK. It was 4:46am so they were quite sure no one would be checking tickets at that time. Her friend assured her she would not be caught. They looked quite young, possibly in their early 20s. Hmmm...🤔 are they being smart or a couple of dumb chicks?. Anyway, we shall soon find out because we would be traveling on the same Airport shuttle. This should be an interesting ride. We hugged my friend goodbye and got on the bus. Do you want to know how this tale ended? 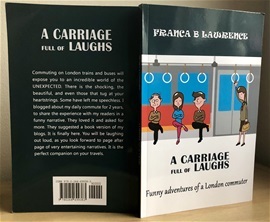 Or read more about my adventures on public transport in Germany and England? The book is available on Amazon in paperback and eBook formats.